I've recently had an issue with my Honda CBR 600f 2002, an abnormal knocking/ticking sound and it was not holding steading revs in low gears at low speeds. On my last ride, I opened her up a little which resulted in an increase of the above problem when returning to low speeds until it cut out. It easily started again and I made it home. Checking the Haynes Manual it indicated a probable spark plug issue. I have removed the spark plugs to check and taken some pics. 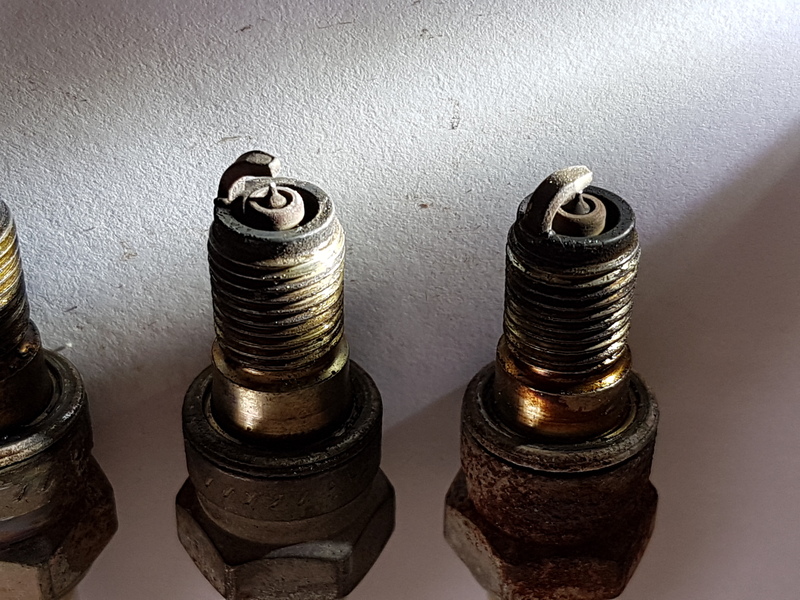 From the spark plug condition chart at the back of the Haynes manual they look a bit carbon fouled and bit worn but, I have no previous experience of this so I'm not sure. 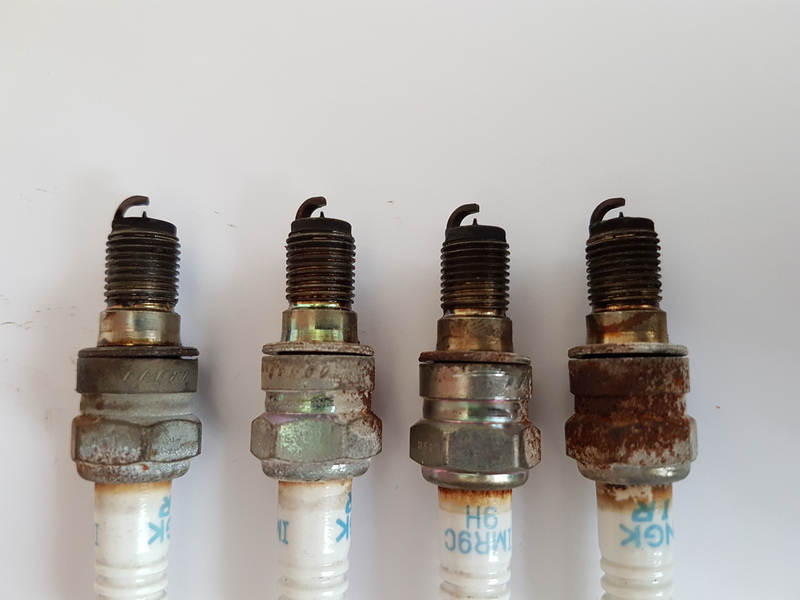 Could anyone with previous knowledge, have a look at my pics and see if they think all of these plugs are worn out and if so, what might be the cause? A big thanks in advance to any help offered. Those plugs look rusty and tired Nick. Did you measure the gap? Looks to be well above 1.5mm from here! How long have they been fitted? What kilometres have they done? Stick new ones in and get back to us with the result. They look old, but what's more important is they are worn evenly. As Seb suggests, put in some new ones and check them after some miles if your problem persists. But don't use a tool to check the gaps. The tiny little tip on iridium or platinum plug can get damaged really easily. I bought the bike at 14500 miles and it's now done 22000. 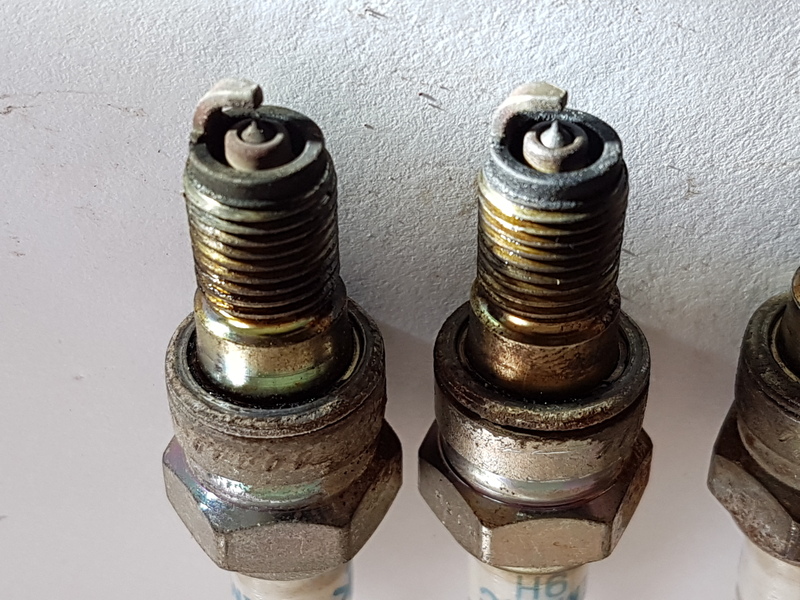 I have not had the plugs changed in the 18 months that I've had it and although it did have a service when I bought it, I cannot confirm whether the spark plugs were changed. The gap looks to be approximately 1mm to 1.2mm, they are all about the same. I noticed that the plugs that I pulled out were NGK IMR9C-H and the manual states that I should have NGK IMR9A-H. I've read somewhere that the C supersedes the A. I can get either. Which would be best? Either plug will work fine. I've just checked with the guy who did a service for me about 10 months ago and he has told me that the valves check wouldn't have been checked. However, he did tell me that there would be an tick, tick, tick sound on start up and until the bike was warm if this was an issue. I'm not sure that I am competent enough to do this check myself. The dealer service only states a full service at 14300 miles. Anyway. I will order myself a pack of plugs and will get back to you in a few days with an update. Hopefully, a positive one. Thanks for the great advice so far. Last edited by Nick Richardson; 06-25-2017 at 12:18 PM. The invoice from the dealer should be itemized with all parts used and exactly the labor performed. The cost should be a clue too, as a valve adjustment runs about $500 alone. You won't hear a tick in the valves. There are no rockers to get loose and clatter. Loose valves are not an issue. They tend to get tight, which causes valves to burn, leading to very costly repairs. He said that he wouldn't have checked them on the interim service I'd had and that he would suggest going to the dealer for adjustment if that was an issue. How easy is the check to do myself. I had a quick scan over the manual and it looked like a nightmare but, I thought that before taking out my spark plugs. You need to get off the valve cover, use feeler guages to check the clearances when each cylinder is in the correct position, then remove the tensioner and cams to see what shims are in it, compute how much larger or smaller you need (and order them), put it all back together and recheck them (you will need a tool to hold the tensioner), then seal the cover and put it all the external stuff on. I'm not sure. Sounds like I might need more tools than my original Honda tool kit for starters. Spark plugs first I think.